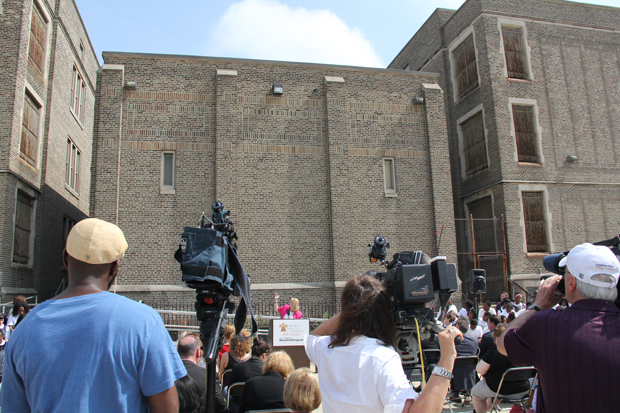 Right now it’s a blank wall on the exterior of what was North Philadelphia’s Harrison Public School and is being completely renovated as the future home of St. Malachy School, one of Philadelphia’s Independence Mission Schools. 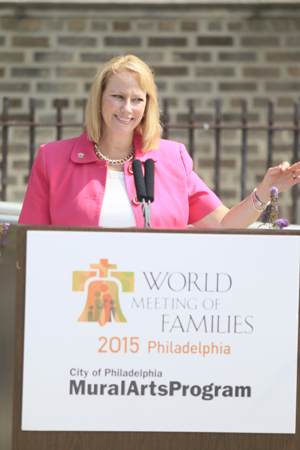 Within a few months the wall be transformed by a 4,239-square-foot mural that will commemorate the upcoming World Meeting of Families and the visit to Philadelphia by Pope Francis. The mural is a collaboration between the World Meeting of Families, the Independence Mission Schools, the City of Philadelphia Mural Arts Program, Wells Fargo as the corporate sponsor, and of course artist Cesar Viveros who designed it. 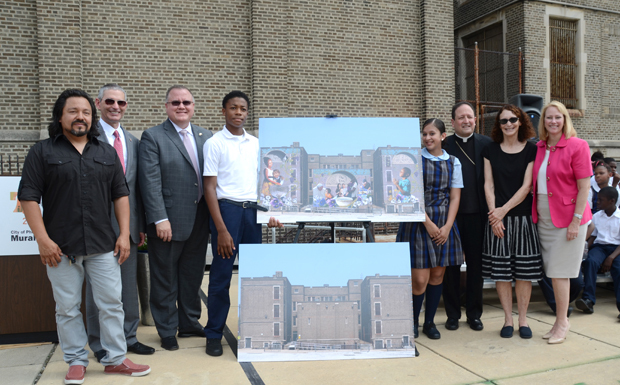 The design was officially unveiled at a ceremony May 28 at the site attended by various dignitaries and most importantly by students at St. Malachy School and also St. Veronica School, both in North Philadelphia. 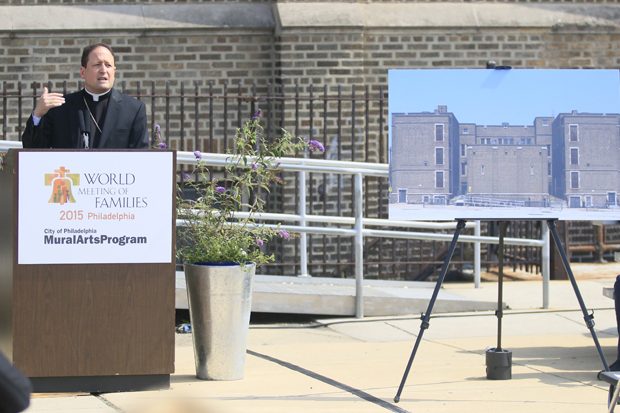 The idea for a mural that will commemorate the World Meeting of Families first came up during the visit of Archbishop Chaput, former Gov. Tom Corbett and his wife Susan, along with Mayor Nutter and his wife Lisa to Rome last year during the early meetings for the World Meeting of Families. 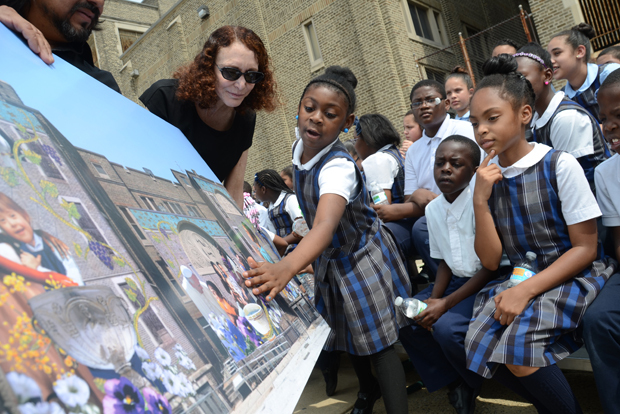 Someone took along books with Philadelphia murals and the idea came up of a mural to commemorate the Pope’s visit, according to Jane Golden, who is executive director for the program that has placed some 4,000 wall murals around the city. The mural’s preliminary design pictures and an extended family including grandparents, parents with a baby, children and Pope Francis, who is in conversation with a little boy, as well as religious symbols. Several artists were consulted before Viveros’ design was chosen. “For years I dreamed of painting a piece that could deepen the subject of spirituality on public venues,” he said, explaining why he jumped at the chance to paint a piece for Pope Francis visit: “This is very personal,” he said. Bishop John McIntyre, who presided at the announcement, said he had seen a copy of the proposed mural but actually visiting the site really put it into perspective. Back at St. Malachy School, Principal Steve Janczewski is preparing for the big move into the new, larger school and he sees it as a sign of the future for Catholic schools in the City of Philadelphia. Meanwhile, the mural has to be painted. It will be done on approximately 153 panels, rather like painting by numbers. It will be painted by students at seven different locations beginning with St. Malachy’s and ending at the World Meeting of Families itself with final installation in November. Portions of the mural will be painted throughout the summer by participants at seven other locations in the region including Children’s Hospital of Philadelphia; Divine Providence Village Day Services Program at Our Lady of Fatima Parish in Secane, Delaware County; Father Judge High School, with students of St. Hubert Catholic High School for Girls; Holy Family Regional Catholic School in Levittown, Bucks County; Holy Family Home, operated by the Little Sisters of the Poor, in West Philadelphia; St. Helena Parish in North Philadelphia and The Joseph Fund in Camden, N.J.
At St. Malachy School two of the student-artists will be Shyeem Bullock and Flor Peralta, both in grade five.